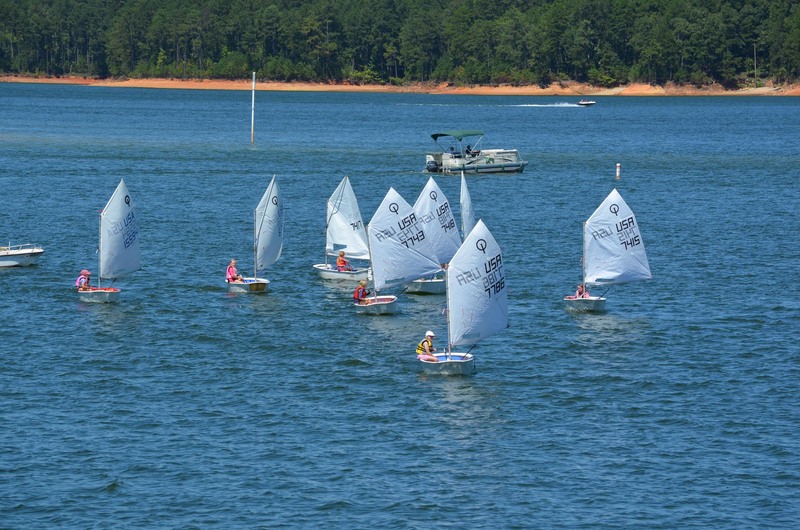 The Atlanta Yacht Club Junior Sailing Program is a fantastic way to learn to sail or improve sailing skills for sailors from 6 to 18 years old. Our instructors make the classes fun and informative. Registration for AYC members is now open. See registration links in course descriptions below. The objective of the beginner class is to familiarize students with the basics of sailing and to allow them to feel comfortable on the water. The students will learn safety skills such as righting a capsized boat, as well as basic rigging, de-rigging and tacking skills. Students will learn the parts of the boat, how to rig and launch a boat, basic sailing, and sailing terms. There will be a combination of shore sessions, fun, and on the water sailing. This is a non-competitive environment. We just want to get the kids hooked on sailing! The students will learn how to safely leave and return to the dock and will be able to sail independently. The basics of tacking, jibing, and docking will be covered. This class is for kids who have the basics covered and are ready to expand their skills. Sailors will work on sailing more efficiently including tacking, jibing, upwind and downwind sailing. Sailors must feel comfortable sailing independently. 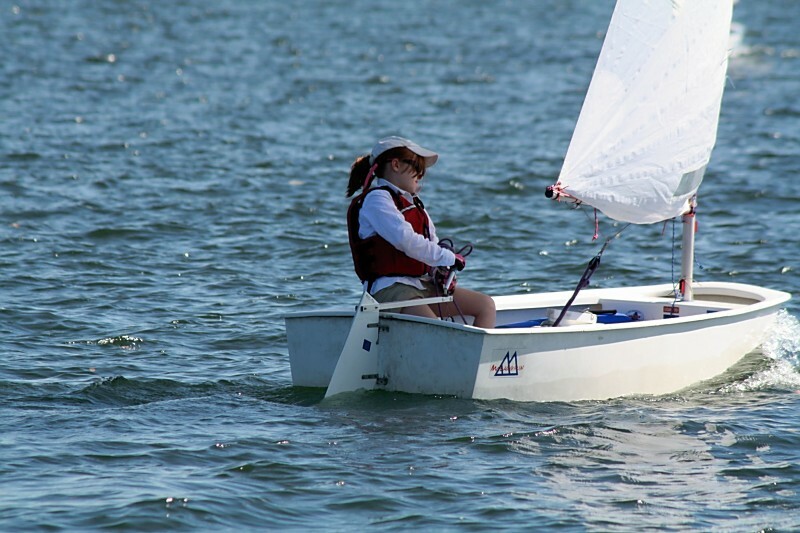 This class is a continuation of Beginner Sailing and a stepping stone to Beginner Racing based on the students interest. After students have completed Level 2 Classes or have participated in Learning to Race or Learning to Sail in the past. Students that have enjoyed learning the sport of sailing and would like to compete and have fun learning to maximize wind efficiency while racing their friends. In the course, the skills they will learn are (but not limited to): Starting Sequence, Basic Course Configuration, Rules of Racing, Mark Rounding, Maximizing Upwind Sailing Angles, Increasing Boat Speed, Boat Handling, Positioning for Speed, Roll Tacking and Jibing, Introduction to Tactics, Having a Race Strategy and More. This class is for older beginners who are new to sailing and sailors new to the 420 and other double-handed boats. Sailors must be at least 9 years old and must have taken a sailing class in the past.. The 420 provides older students the chance to learn in a double-handed boat. It will also teach previous Optimist sailors skills to sail in a double handed boat. Students will learn how to both crew and skipper. The focus of this class will be sailing as a fun, social sport. This class will also have the opportunity to sail in AYC Club Boats such as Yflyer, Snipe, and Thistle! Coaching: Club Volunteers. 1 adult, 1 junior, 1 safety. Use fleet boats with fleet volunteers to take kids out and skipper/crew on fleet boats. We will have an orientation meeting the first day of class. We will let the parents know that our classes are NOT drop off classes. Parents are required to stay close to the sailing area to help out where needed or just to be there for their child. We will have information about snack parents and volunteer opportunities at the orientation meeting. Throughout the summer we will have some sailing opportunities for parents during classes too. The first class will begin with a swim test. All kids will be required to swim the length of the dock and back with their life jackets, tread water for 5 minutes without life jackets and then put their life jacket on while in the water. Kids must have a properly fitting Coast Guard Approved life jacket. Boats have to be rigged by the 9am start of class, except for the Guppies class. Rigging will be covered week 1. Boats rigged by 9am weeks 2-8. Parental assistance will be needed. We know that most families have other summer plans and that kids will miss class. This is okay. Our coaches will do their best to help get everyone up to speed after an absence. In case of bad weather, we will still hold classes. We will do indoor activities on these days. When you arrive at the Yacht Club entrance, pull up to the gate. It should be on Automatic and will open when you pull up to it. Classes will be help on the Opti dock in front of the clubhouse, waterside. Or in the lower level of the clubhouse Jr. Room. Prices: $125 Yacht Club Members; $225 non-members, If a student wants to sign up for the Learn to Sail a double-handled boat class along with another class the class price would be $75.00 for the 2nd class. T-shirts will be available for purchase for $20 and Polos available for purchase for $25. These shirts have the logo with Jr. Sailing Racing Team below the burgee.